It can be argued that one of the most important and treasured cultural aspects in the Black community is our faith. We are overwhelmingly Christian. The church has played a key role in our cultural and spiritual development almost from the time our ancestors were first dragged here in chains. At times, God and His church were all Black Americans had to cling to in the darkest oppressions. Even as we have moved from segregation to freedom we have always held fast to the tenants of God’s Word, and as a result we are largely socially conservative as a group. However, when it comes to our votes we don’t seem to carry that same adherence to our faith to the polls. The official platform of the Democrat party embraces gay marriage, while the Black community sees this as antithetical to God’s Word. Despite being only 12% of the population and representing over 35% of abortions, the majority of Black Americans still believe life is God-given; and yet the Democrat platform endorses abortion. Record unemployment in Black communities and America in general, 47 million Americans receiving food stamps, skyrocketing energy prices and a debt that threatens to topple the country seem to have very little effect on Black Christians – by all indications they are still solidly in Obama’s camp. Some say it is because they were uncomfortable with Romney’s Mormon faith, some genuinely believe that he (and his party) is racist and would roll back civil rights. Some say that things really will get better if we just hang on a little longer and don’t change horses mid-race. I want to ask this question specifically to my Black Christian brothers and sisters: Do your political loyalties represent your faith? 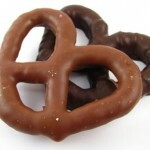 Next time you vote, will you be voting as a “Chocolate-covered pretzel” or a participant in the Kingdom of God? I know what’ I’ll be doing.